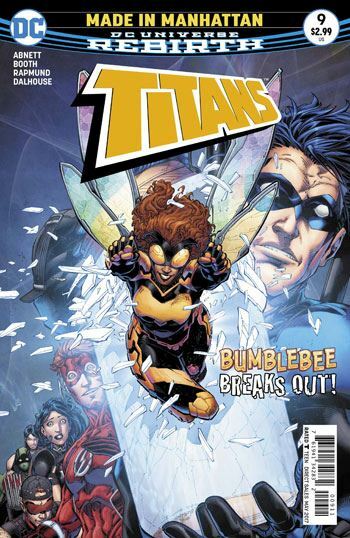 I have to admit, Titans #9 is not the best issue of the book so far. It’s not a bad issue, it just feels a bit formulaic. You can pretty much tell how it is going to conclude from the get go, and there are no big surprises along the way. Bumblebee remains at the core of this storyline, and that’s a good thing. I have always liked Karen Duncan, and Dan Abnett clearly has some great ideas in store for the character. To quote the issue, “she may be the key to an entirely unexpected source of alpha-class meta-powers,” so Bumblebee will develop into a lot more than a woman who flies and shoots darts out of her bum. 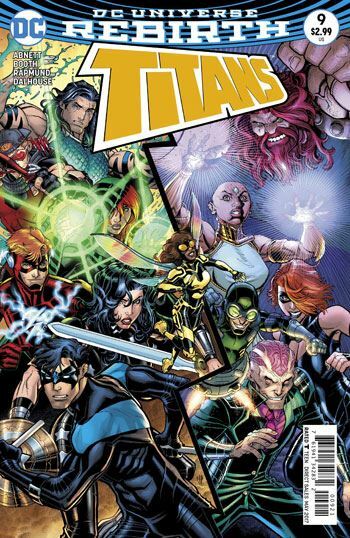 At the end of the previous issue (and the start of this one), the Titans have realized that the organization that Karen has turned to for help with her powers is really the Fatal Five, looking all businesslike. The former villains insist that they have changed for the better, and even given up their powers. As proof of this, they…umm…say they have given up their powers. They haven’t given up their powers. Did that deserve a spoiler alert? I certainly hope not. If it did, you are probably far too gullible to be allowed to read fiction. But the Titans spend most of the issue wondering whether this is true, and investigating it, before coming to the same conclusion that I, and I expect most readers, reached by the second page. The Fearsome Five are back. The one scene that I did really enjoy had Arsenal talking about how people are capable of change, referencing his days as an addict, but also emphasizing how this is a long and challenging process. Mammoth had been acting as a villain only a few issues earlier. There had no been enough time for him to have undergone any meaningful improvement. The art, by Booth and Rapmund, looks just great. I have enjoyed every issue they have done. And I don’t really dislike the story. I imagine that, in a collected edition, it will read perfectly well. It’s just not very grabbing as an issue in and of itself.